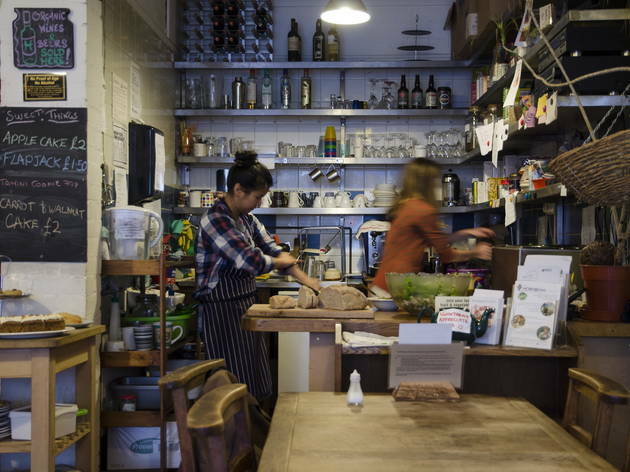 A friendly daytime café with a concise menu of wholesome vegetarian and vegan food – much of it grown locally. N.B. 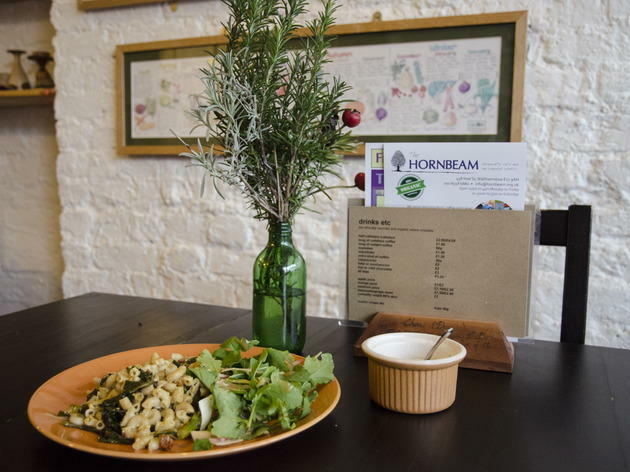 The Hornbeam is now running as a partnership with local food business Norman Loves. 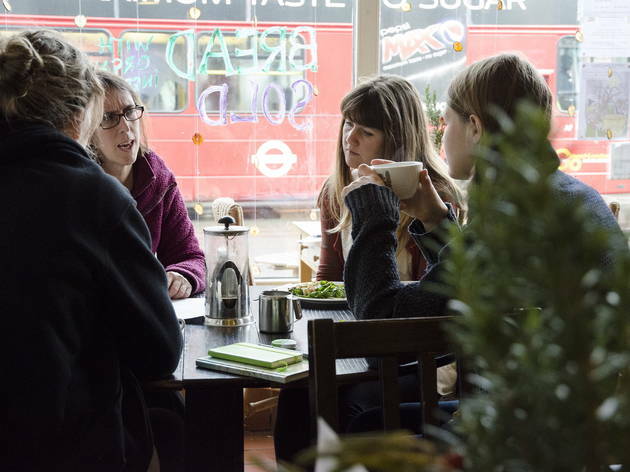 The café continues to serve vegetarian and vegan food with much of the veg locally grown by Waltham Forest-based workers co-operative Organiclea. The review below was written before the re-launch. The wall outside the Hornbeam is lined with part-used paint pots for the taking, and adverts for cheap scaffolding boards. Inside, the walls are covered in adverts for yoga and tai chi classes, and information on how to live sustainably. So, no question of where this café’s heart lies. 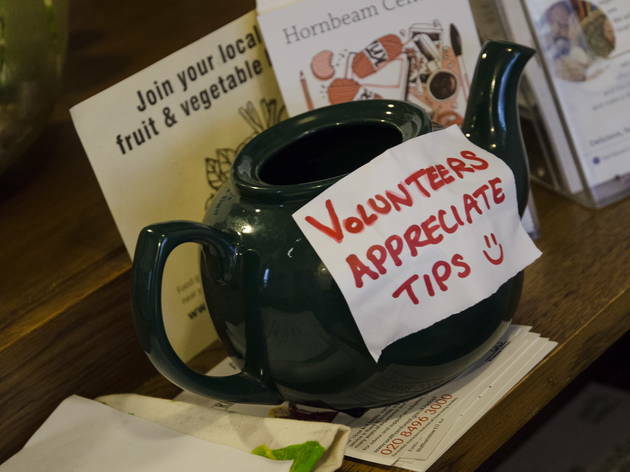 The welcome is friendly, the atmosphere relaxed and the food mainly sourced from OrganicLea. 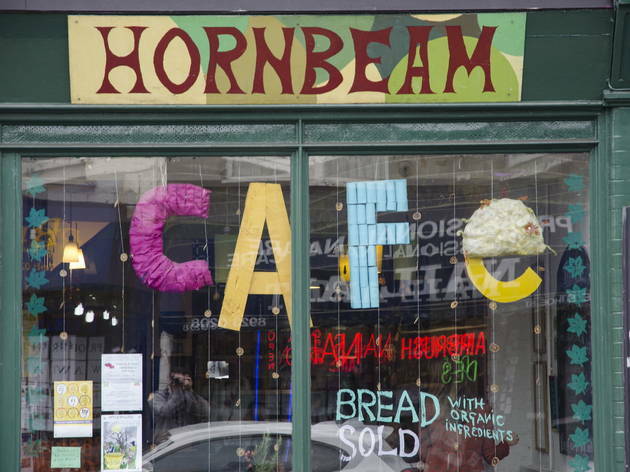 Even the bread is own-made by the Hornbeam Bakers’ Collective. The daily changing menu is short, comprising on our visit of a soup, a tabouleh dish and a salad – though toast and a host of cakes, including banana bread, were also available. The food isn’t especially adventurous, but it is fresh, wholesome and satisfying. 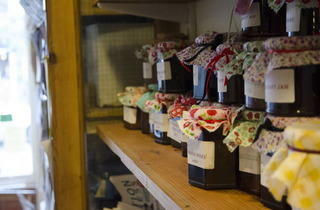 There’s free wi-fi and bread for sale, as well as a variety of chutneys and jams, even some hand-carved wooden paraphernalia. Exciting? No, but we can’t help liking this place. This place is an awesome community hub operating as a cafe. With regular foodie pop ups (usually if not always vegan!) and regularly home to a ‘pay what you feel’ meal, this place really is a gem. The latest residency of ‘The Spice Box’ has been brilliant! 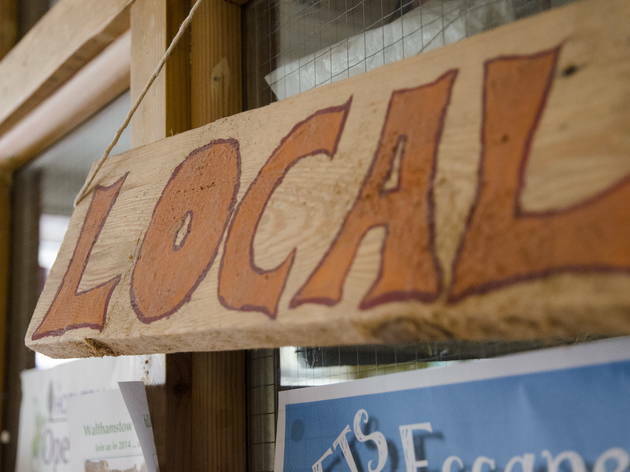 Delicious local food, fantastic local business and community hub doing great work. Simply because its vegan, LOVE IT !!!!!!! Amazing organic coffee from Perky Blenders! Local community vegetarian cafe serves home-made food cooked with locally grown organic vegetables. 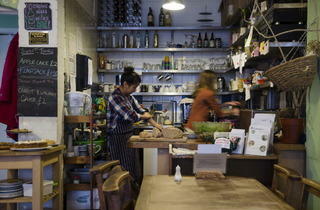 A down-to-earth, unpretentious place (no hipsters yay!) with a relaxed atmosphere, some great art and music by local artists, as well as daily community events for all. 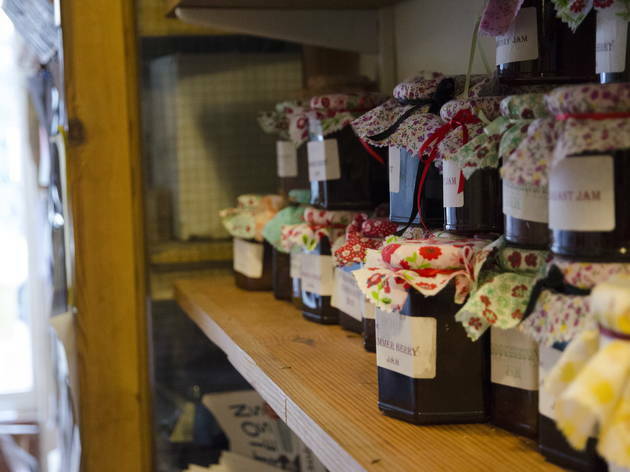 Secret tip: They have an incredible home-made vanilla-rhubarb jam, try it with their sourdough toasted bread - you won't regret it! Amazing food with such great principles. Not just good for the body but for the soul too! Great veggie/vegan café. Dishes are all home cooked fresh. Breakfasts and home made soup with sourdough bread are particularly good. 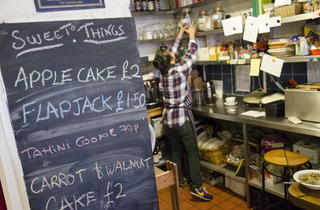 Great café - shows that local, seasonal food can be really good. 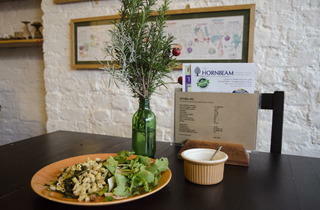 Delicious, affordable and inspiring healthy food plus lovely people! We are very blessed to have some of the best vegan/vegetarian chefs in London cooking up a seasonal organic low-key storm in Walthamstow. 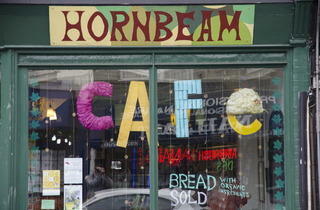 Please give The Hornbeam Cafe​ a vote if you have a moment... and go and eat their food if you haven't had a chance yet. Locally sourced, organic food, healthy, delicious. The cakes are a dream, and you would never know they were dairy-free. Crowd is super local and often seem to know each other (or it's just very friendly). Always a good feed. Excellent sausage sandwich on a Saturday morning! Good to see this cafe still doing so well. Great concept and even has an organic veg stall outside. I'm not vegan. I'm not even a veggie! But this Cafe and community hub has so much love to go round, they have fantastic coffee and their food is beyond delicious. 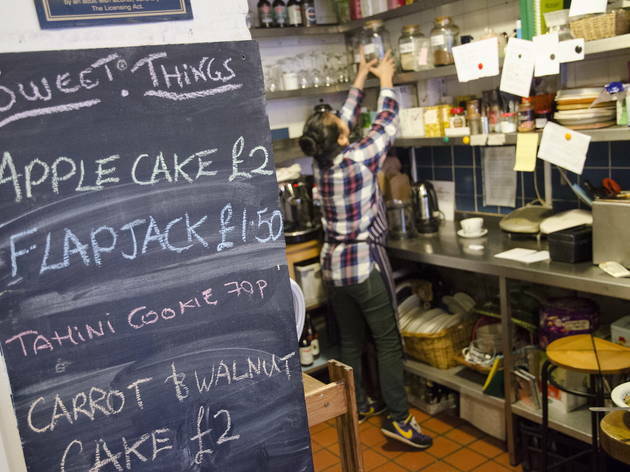 With homemade jams and breads, recycling projects and charity drives, and the kindest, most well-meaning people working there, this little hidden jem is my favourite place in London. Lovely little cafe and a great community hub. 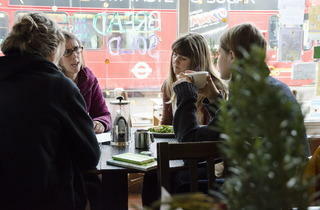 Good vegetarian grub and coffee and a friendly atmosphere. 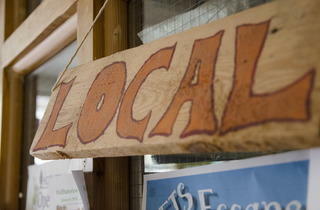 Owned by and home to a creative, environmentally caring community. You can even pick up an old tin of paint at the paint swap! Been to the evening supper club/melting pot events three times. Each time the food was tasty and wholesome, and the atmosphere very friendly. I felt so good after eating there that I wanted to climb on the table and wave my arms aloft with delight. I didn't though, in case the other diners were alarmed. Still a gem to be discovered by the Leyton people. It seems to be in the wrong place when it should be in Dalston or Walthamstow Village. It is fine fine fine and has Leyton prices. Hot choc and delicious a mere £2. Always loads of community stuff to read and art exhibitions to peruse. You can stay there quite relaxed out of the rain, out of the sun, use the wifi, do your knitting, listen to Motown. Its handicap is its opening hours.